If you have a lip piercing you’ll know that there is a huge choice of lip piercing jewellery out there, so why not treat yourself to something a bit different with some of this cute lip piercing jewellery? The basic items of lip piercing jewellery – labret studs and BCRs – can be customised with all sorts of cute motifs, designs and colours. You can choose from sparkly crystals, love hearts, girly colours and lots of cool designs. 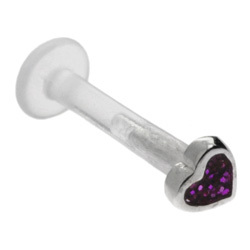 Here at Body Jewellery Shop we have a great choice of cute lip piercing jewellery, so no matter what your taste is, there is something perfect for you. If you want to go cute and girly, you can’t beat cute heart jewellery. 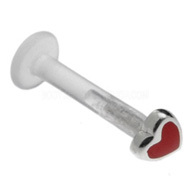 A little heart looks gorgeous on your lip piercing and our new designs mean that you can find lots of tiny hearts that look fab and are comfortable to wear. 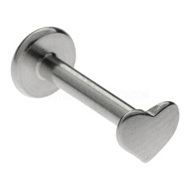 You can replace the ball on your labret with a screw-on heart, go for one of the pieces below or go for a cute love heart ball closure ring. This entry was posted in Labret Piercings, Labret Studs and tagged Body Piercing, Body Piercings, lip, lip piercing jewellery, lip piercings, lip rings on December 17, 2010 by Piercing Guru. 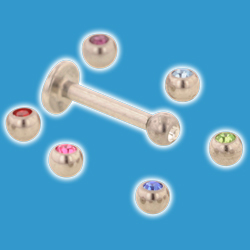 It’s almost back to school time and for many BJS customers that means one thing – hiding your piercings! But never fear, here at BJS we have plenty of great piercing retainers to help you hold onto your piercings through term time. From clear piercings jewellery to safe metal-free studs, there are lots of options to suit you, your piercing and your school. Over the next week I will be showing you which piercing retainers are the best for different types of piercings. Today I am focusing on lip piercing retainers. Lip piercings are very popular and they are banned in most schools. It’s easy to see why schools have such a problem with lip piercings – they are highly visible and literally in-your-face. Some schools have banned lip piercings all together while more moderate schools are happy as long as you use a discrete lip piercing retainer. Lip piercings are relatively difficult to hide but if you choose the right lip piercing retainer you can make your lip piercing very hard to spot. This entry was posted in BioFlex Body Jewellery, Hiding Your Piercings, Labret Piercings, Labret Studs and tagged hiding piercings, Labret Stud, Labret Studs, lip piercing jewellery, lip piercings, piercing retainers on August 18, 2010 by Piercing Guru. It’s good to know what can go where in the piercing world, especially if you are new to it and unsure of the different types of face lip piercing available for example. The face lip piercing can be filled with studs, retainers, or rings and the great thing is that you can also use face lip piercing jewellery for various locations such as in the centre of the bottom lip, top lip and snakebites which are placed either side of the lip. Ball closure rings, circular barbells and labret stud can all be used in a face lip piercing, giving you plenty of choice. The lip studs are great for piercing low down on the lip, as the design has a flat backplate which sits comfortably against the teeth and gums, this also prevents irritation and damage to the mouth. Lip studs come in various materials, so whether you like the look of gold plated or comfort of BioFlex you can pick and choose to suit your mood. This entry was posted in Adult Body Jewellery, BioFlex Body Jewellery, Gold Body Jewellery, Labret Studs, Types of Jewellery and tagged Body Jewellery, lip jewellery, lip piercing jewellery, lip piercings, lip rings on July 16, 2010 by Piercing Guru. Snake bite piercings are a set of two lower lip piercings – one on either side. This type of lip piercing is very popular and it is easy to see why. It looks gorgeous, is quick to heal and suits almost everyone. Snakebite piercings are usually done at the same time and they are pierced in the same way as a single lip piercing. The piercing will first mark-up the placement and use a clamp to hold the lip firmly. They will then pierce one snake bite at a time, inserting the initial jewellery as they go. Initial jewellery for snake bites piercings can be either ball closure rings or labret studs, both of which have their advantages. Whichever initial jewellery you choose for your snake bites, made sure that there is room to accommodate swelling. Most lip piercing swell a little at first and if the initial jewellery is not big enough to accommodate the swelling, this can cause problems. You piercer should be able to answer any questions you have about snake bite piercings and advise you on suitable jewellery. Once your snakebites are healed you can choose between BCRs, labret studs, smooth segment rings and even body spirals. These piercings are usually quick to heal and are relatively easy to care for. This entry was posted in Labret Piercings and tagged lip, lip jewellery, lip piercing jewellery, lip piercings, lip rings, snake bites on May 6, 2010 by Piercing Guru. When you think of lip many people just think of labrets but side lip piercings are increasingly popular as an alternative piercing. Lip piercings can be placed almost anywhere around the lip and look great planed on the side of the upper or lower lip. When placed on the top lip, side lip piercings are called Monroe piercings or Madonna piercings, due to the fact that both women had a beauty mark on the side of their upper lip. Bottom side lip piercings do not really have a proper name, except if there is one on either side, which is referred to as â€œsnake bitesâ€. Rings are suitable for wear in any side lip piercing that is near the lip line but they are only usually worn in side lip piercings on the lower lip. Most people can wear a ring in the side lip piercing but it is important to get a ring that is the right size, or it might be uncomfortable to wear. To get the right size youâ€™ll need to measure the distance from your piercing to the top of your lip, and add a millimetre â€“ you will need a lip ring with the same internal diameter as this measurement. 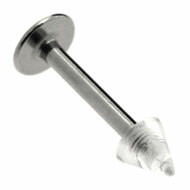 A lip stud is probably the most comfortable piece of jewellery that you can wear in a side lip piercing. 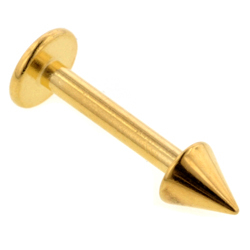 These studs are available in a huge choice of styles, materials and sizes, so youâ€™re sure to find plenty you like. They are less likely to catch on clothing or cause damage to your mouth. Jewellery rubbing on the gums or teeth is always a risk with lip piercings. This can cause dental problems, so if you have any discomfort or notice gum recession we recommend switching to a Medilabs labret or a BioFlex labret stud. Both these studs are softer than a regular metal stud â€“ especially BioFlex studs â€“ so there is less chance of damage. This entry was posted in Labret Piercings, Labret Studs and tagged lip jewellery, lip piercing jewellery, lip piercings, lip rings on May 4, 2010 by Piercing Guru. Labret piercings are one of the most popular type of piercing and it is easy to see why – they suit everyone, look fab and give you two jewellery options: labret studs or labret rings. Whether or not you can wear a labret ring depends on one thing – the position of your piercing. If your piercing is close to your lip you will probably be able to wear labret rings but if your piercing is too far down a labret ring would be uncomfortable. If you are not sure about whether you can wear labret rings or not I suggest asking your piercer, but as a rule if your labret piercing is near your lipline you will be able to wear labret rings. There is a huge range of labret rings available from plain steel rings to funky colours that will really stand out. 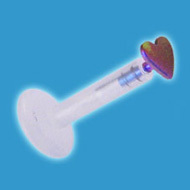 The most popular type of labret ring is a BCR or ball closure ring. BCRs make excellent labret rings because they close completely and come in a choice of sizes to suit your lip. The ball in your BCR labret ring should sit on the outside of your lip. If you want a more streamlined look then check out smooth segment rings like the one below. These are the same as BCRs but instead of a ball they close with a smooth section of ring. 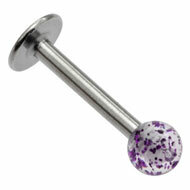 Whichever type of BCR labret ring you choose they are a real classic look. This entry was posted in Ball Closure Rings, Circular Barbells, Labret Piercings and tagged Body Jewellery, Labret Jewellery, Labret Piercings, Labret Rings, lip jewellery, lip piercing jewellery, lip piercings, lip rings on April 19, 2010 by Piercing Guru.